Chances are you've seen the previews for Bad Moms starring Mila Kunis and Kristen Bell, and you may have even seen the movie this weekend. That's what Florida moms Brooklynn Cahill and Juliana Valverdi planned to do, but they were turned away for the most shocking reason. It all started when the pair got invited to a mom's night out event on Facebook. The event entailed dinner and a movie, and 50 moms were slated to attend. Cahill and Valverde bought their tickets ahead of time and were really excited to have a fun, carefree night out. Being that they're breastfeeding, though, they decided to bring their babies along. After all, they could just head out to the lobby if their little ones started crying, right? Wrong. The women arrived at the cinema with their babies and picked up their tickets, but Cahill and Valverde were quickly singled out and not allowed into the movie. Why? Because Bad Moms is rated R, and apparently their local theater—Regal Cinemas at Bell Tower Shops in Fort Myers—doesn't allow children under 6 years old to enter movies that carry this rating after 6 p.m. This makes sense for children of a certain age, but Cahill and Valverde were toting sleeping infants who wouldn't be able to understand the film's raunchy moments. Let's also not forget that they're breastfeeding, which makes it really hard for them to leave their babies at home. The cinema staff told the moms to go see Ice Age: Collision Course instead—despite the fact that the movie had already been playing for an hour. 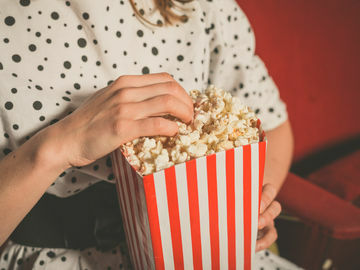 It's important to remember that in most cases, people under age 17 are able to enter R-rated movies as long as they're with a parent or guardian. Granted, if the rules mentioned in the report released by News-Press are correct, the mommy outing did violate the theater's terms—but the policy seems a bit unreasonable in this context, right? To make matters worse, when Valverde went to talk to a manager, the manager noticed she was breastfeeding and asked her to immediately cover up. "I am very modest about breastfeeding and, because of the fact I was doing it, I was even more embarrassed," Valverde recalled. "I always have a blanket to cover." There is a bright spot in all of this: When the other moms saw how upset Cahill and Valverde were for being singled out, more than 35 of them walked out of the theater in solidarity. "I feel so loved by all of them and couldn't thank them enough," Cahill said. What do you think? Should these moms have been allowed into the movie? Tell us in the comments.